Dress it up for a night out! 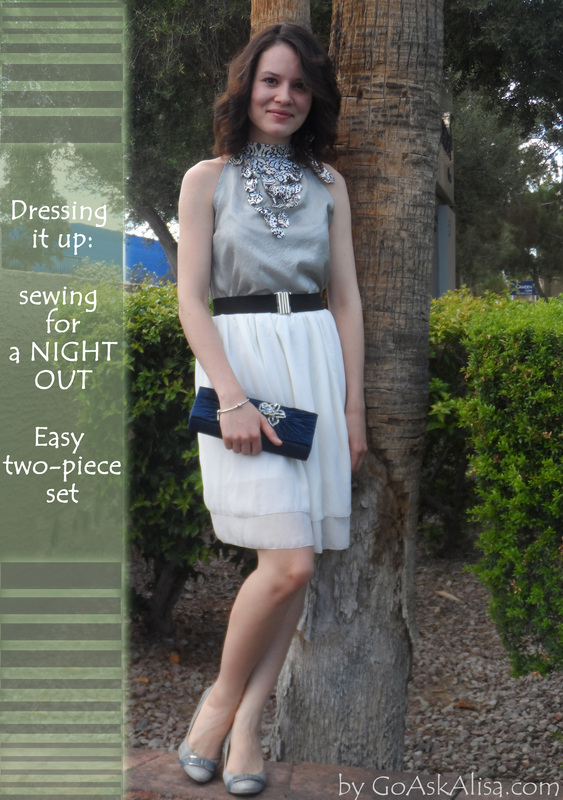 Sewing and designing evening wear – Go ask Alisa – DIY capsule wardrobe one stitch at a time! Alright, how many cardigans, blouses, skirt and shirts have you made for your daily wear? Numerous amounts… Well, how about something special, for a unique occasion? Yes, I am talking night out and let’s take it seriously. Sewing for a special occasion can be tough for several reasons: fabric is usually less available and more expensive, there are usually certain styles that are considered to be “special occasion wear” as well as color choice can be limited. For summer I love to use floral prints, but since those are so popular I like to stand out and stick to the solid and bold color combinations. Special occasion wear also usually features more of a “hand-made” details, like embroidery and applique. This outfit is composed out of two pieces: layered chiffon skirt and halter neck top. As far as patterns go – I used layered skirt pattern several times, self-drafted and it never failed me. Halter neck top is copied from already existing top that I bought quite some time ago in Promod label shops. Fabric: for skirt – white chiffon and white cotton as lining. For top: silver wrinkled silk and paisley print satin. New techniques: For an applique detailing on a top I wanted to create a jabot effect. Something flirty, romantic, but not over the top. Technique is very similar to the fabric flower brooch description. 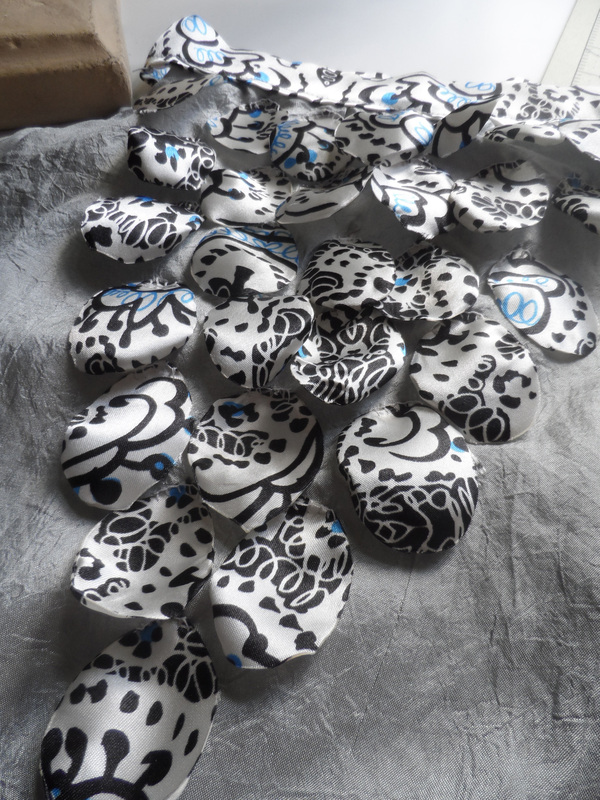 All you need to do is cut drop shaped pieces of your scrap fabrics. Cut out as many as you need to make this applique. I had somewhere between 20-30. You can mix and match shades and colors as you wish. I chose to stick with the fabric print that I had. When you are done cutting , light up the candle (please be careful while working with fire) and gently finish the edges. You will see that edges of fabric will harden up forming into a beautiful shape. This will allow you to hand stitch these pieces onto your top, it will prevent fabric from fraying as well as give it some shape. Pattern for skirt: measure your waist, mine is 18″. This will be your elasticated waist band. Then use approx. twice as length as of your waist length if you want a big puffy skirt, if not, use about 10″-15″ more. I used a length of 28″. For all three pattern pieces: 1st layer of chiffon, 2nd layer of chiffon, 3 layer of cotton use the same width ( 28″ in my case). Then depending on how long you want your skirt draft 3 rectangular, with height difference in about 2,5″ difference. Then layer the skirt: cotton lining underneath, then longest chiffon layer, then shortest chiffon layer. Gather them up by running through with widest basic stitch you have and then gathering them up. Add an elastic waistband. I absolutely love the combination of grey and white, it makes beautiful formal/special occasion wear. You can pair it up with sequined jacket for a party look or cropped tux jacket for a formal appearance. What do you think? Oh that is perfect! I love the detail! Beautiful work! I really need to start sewing for myself!! That is very creative and what a way to use up fabric remnants as well. Like Terri said, the detail is amazing!